Will summer ever arrive?! If you’re bored of waiting for it (like us!) you may be tempted to warm up in the beautiful Canary Islands; just three hours from Spain by plane, these islands have the perfect climate, and their landscapes will make you breathless. If you are also looking for an island where you can enjoy some unique scenery and a few days of relaxation, Lanzarote is the perfect option. I had visited Lanzarote as a kid with my family and had memories of arid lands and days of boredom. But my thoughts back then must have been tainted by my grumpy adolescent hormones, as now Lanzarote enchants me with it’s stunning landscapes. If you want to discover the best places to visit in Lanzarote, here are my honest recommendations. The best way to make the msot out your trip to Lanzarote is to rent a car travel to travel around the island, as public transport is admittedly not great AND also, some places on the list cannot be reached by public transport. Rental prices are very reasonable, the roads are good and there is not much traffic beyond Arrecife, the main city of Lanzarote. Plus, who doesn’t love a good old road trip! El Mirador del Río is an amazing viewpoint – a piece of natural beauty modified by Cesar Manrique, a Canarian artist who is considered a hero on the island. Pictures do not do it justice! You HAVE to go see it! The entrance to the viewpoint costs 5 €, but if you want to save you can also walk a few meters to the right through a small path to enjoy the same (or even better!) view without the crowds. From that point, you can see La Graciosa (a different island) and if the day is clear you can see even more islands that form the Chinijo archipelago. The views are very impressive, but remember to take a scarf with you as the wind in Lanzarote is constant, and up high at El Mirador del Río it can get very windy! Los Jameos del Agua is a series of stunning lava caves located in the town of Haría. A “jameo” is a hole in the earth that it is created when the roof of a volcanic tube collapses. Los Jameos is part of a volcanic tube that originated by the eruption of the ‘La Corona’ volcano. The natural wonder was amodified by local artist Manrique and turned into an art, culture and tourism centre. At Los Jameos del Agua you will find three holes, the “Small Jameo”, the “Big Jameo” and the “Jameo of the casserole”, these three were modified by Manrique to create a space where man and nature combine to amazing effect. Jameos del Agua now consists of a subterranean salt lake, a restaurant, gardens, emerald-green pool, a museum and an auditorium. TIP: On Saturdays you can enjoy “Timple” concerts, a local sound. You can also see the “blind crabs” a unique endemic species of Lanzarote. Cuevas de los Verdes is linked to Los Jameos; a tunnel of volcanic origin that is more than a kilometer long. You can take a guided tour that lasts around 50 minutes, where you can enjoy the spectacular landscape of the caves and learn about the mythology and legends behind them. It is a walk that you will not forget. I mean, how often do you walk through a tunnel created by the explosion of a volcano?! If I had to choose only one place to visit in Lanzarote, it would undoubtedly be the island of La Graciosa. This small island is part of the Chinijo Archipelago and has a population of just 700! It’s sandy volcanic coasts are simply beautiful, you’ll be spoilt by white sand beaches with crystal clear water and views of mustard-coloured mountains. You can visit the island by taking a ferry from Orzola in Lanzarote that will take around 35-minutes and leaves every hour. Once in La Graciosa you can take the walking routes or rent a bicycle to reach the beach called “Las Conchas”, which in my opinion is one of the most beautiful beaches. If you are the type of person who loves to explore little towns, you should not miss a trip to Haría. The town is very small but super impressive, full of cactus, palm trees, and cute white houses. In the centre you can enjoy a small market and a number of delicious restaurants serving local food. Another place that you should not miss in Haría is the house of Cesar Manrique, where you can enjoy the artists paintings and sculptures. We found our visit to Teguise one of Lanzarote’s most pleasant surprises. It is another typical little Spanish town with white houses, similar to Haría. It has an amazing Sunday morning market where you can find cute local handicrafts. The atmosphere is amazing as there are live concerts in the streets and also bars at the end of the market. Timanfaya National Park is another must visit whilst in Lanzarote. It’s a magical volcanic landscape, with beautiful mountains and huge craters. Along with the views, highlights include a demonstration of how they roast chickens on a natural barbecue (heat from the earth! ), how and why steam erupts from geysers when they pour water in, and talks on the lava fields and history of the park. A truly fascinating place. A visit to the Volcanoes Natural Park, next to the Timanfaya National Park, is completely free. If you’re a hiker who appreciates a good view then do not miss this place. You can get info on all the different walking routes from the Visitor Centre, however, some do need to be booked in advance as they are more difficult and it’s mandatory to wear decent climbing shoes. But, if you’re not a regular hiker, don’t panic, as there are also easier routes that are well worth a visit. On the west coast of Lanzarote, near a small town called Yaiza, you’ll find a beautiful sight known as the green lagoon or the green puddle (lagoon sounds much better, hey?!) Waves from the Atlantic ocean have swept into the crater of an extinct volanco and the algae at the bottom has made the water look a magnificent green. Once you’ve been mesmerised by Charco de los Clicos, relax on the nearby black sand beach known as El Golfo. It is said that Parrots beach is the most beautiful beach on the island, although I have to admit that it’s personally not my ultimate favourite. Nevertheless, it is certainly worth a visit, especially on a sunny day where you can enjoy a dip in the ocean. There are a couple of bars nearby if you want to treat yourself to a cocktail. If you visit Playa de los Papagayos you also have the option to check out two different nearby beaches: Playa de la Cera and the Caleta del Congrio. Yes, we said ‘wine route,’ meaning you can take a tour of Lanzarote’s many wineries which are surrounded by beautfiul natural valleys. Sounds good, hey? If you’re a fan of a nice glass of red or white, this is a must-do. The most famous winery is called El Grifo, which also has an interesting museum. If you want to check this out you have to take the LZ-30 road from Uga to Teguise. Not so long ago you could get taste for free, but nowadays it is a paid tour, unfortunately! However, it is worth it as it’s not only tasty but also fascinating, especially seeing how they grow the vines in the volcanic earth. If you’re into water sports, you will enjoy Famara. It is known for being a town of full of surfers and wind-surfers as this coastline usually has strong winds, perfect conditions for riding some beautiful waves. It has a great atmosphere, full of energy with locals and travellers enjoying themselves together. The Garden of the Cactus is another creation of the artist Manrique. It is an old “rofera” (aka quarry) converted by Manrique into a large cactus garden. Today there are more than 4,500 cactus’s and 450 different species. Just look, don’t touch… it could be painful! Personally, I am not a lover of touristy places, but like marmite, Puerto del Carmen might be to some peoples tastes. It is an area full of resorts, bars and restaurants. So if you want to hit a good party in Lanzarote, this may be your place as there are nightclubs and cocktail bars galore. It’s almost like you a mini Benidorm in the heart of Lanzarote! Hostels in Lanzarote are an excellent option if you want to keep a low budget for this trip. If you loved what you just read about the town of Famara, you will definitely fall in love with Eco Lodge Famara, which is a design house in the middle of a natural environment. Kalufa House is a villa in the small village of Cuchillo de Tinajo, which has a swimming pool, garden, solarium and barbecue that guarantees some fun nights. If you want to immerse yourself in the most rural Lanzarote and discover the secrets of the north of the island, stay at Casitas Tabayesco, where you can rent bicycles to reach the desert beaches and the fascinating caves. La Laguneta apartments is your best option for a quiet holiday just 500 meters from the beach. And check out Finca Marisa if you want wake up with views of the volcanoes and sleep just 10 minutes away from Timanfaya Park ? Extra recommendations I strongly recommend the rental of a car when visiting Lanzarote and luckily there are many companies that offer a good, cheap rental service. If you want to explore the whole island you will need it and you wont regret it. Do not forget to bring sunscreen and a hat or something similar. In Lanzarote it is sunny all year long and the hat is very useful, although you also better have something to tie it up because the wind in Lanzarote does not stop. For that reason, a hat will be very useful if you do not want to end up with a crazy hair during the whole day. Winter is a great season to visit Lanzarote. Although it can rain every so often in Lanzarote, especially between December and February, the temperatures rarely drop below 14º. Now you have all the recommendations you need in order to visit in Lanzarote, so it is your time to explore the island. About the author: Andrea Bergareche is creative by profession and traveller by vocation. In 2012 she travels for the first time alone to Mexico, and she spent a study year abroad for her art degree. Since then she has been obsessed with travelling. In 2015 she embarked on his first solo long trip as a backpacker. A trip that had initially been planned for two months, but ended up lasting seven and in which she went from Argentina to Colombia hitchhiking, tattooing and painting. Since then she has not stopped travelling. On her blog, Lápiz Nómada, she encourages women to travel alone and to do it with creativity. You can follow her next trips on Facebook, Instagram or Twitter. 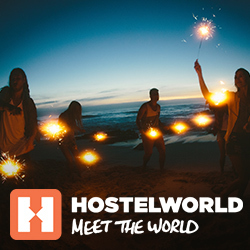 The post 14 Unmissable Places In Lanzarote appeared first on Hostelworld Blog.